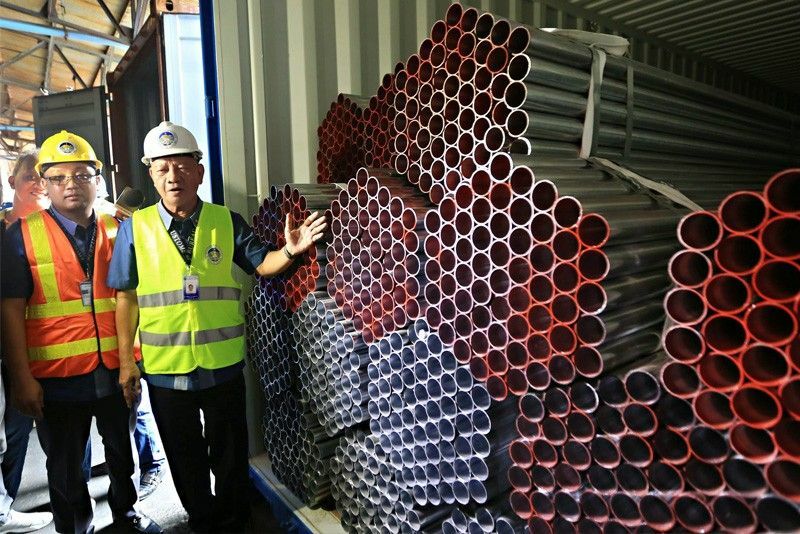 Customs Commissioner Isidro Lapeña and collector Vener Baquiran show steel pipes and tubes, part of a shipment seized at the Manila International Container Port yesterday upon its arrival from China. MANILA, Philippines — The Bureau of Customs (BOC) yesterday seized P18 million worth of steel pipes and steel tubes from China that arrived at the Manila International Container Port (MICP). In a statement, the BOC said that on July 7, the steel pipes and steel tubes were declared to weigh only 16,380 kilos but the real weight is 27,100 kilos. Based on documents, the shippers were identified as Guangzhou Chuantong Imp. & Exp. Trading Co., Ltd. and Hebei Yongteng Trading Co. Ltd. of Guangzhou and Heibei, respectively. The shipment was consigned to Siegreich Enterprise, whose office is in Binondo, Manila. Meanwhile, the BOC also intercepted three 40-footer shipping containers consigned to Hepomlan Trading for misdeclaration and the lack of an import permit from the Food and Drug Administration. The shipment, which arrived on May 13, was declared to contain screws, earphones, inflatable toys, mold, aluminum oil box, mat, labeling machine, freezer, plastic container, blouse, skirts, cell phone stand and printer fitting. The shipping containers were found to hold P12 million worth of teeth whitening sets, aerosol insecticide, wedding ring cases, sporting goods, cutlery sets, lamp shade and hair treatment. BOC Commissioner Isidro Lapeña said once the steel pipes and tubes are forfeited in favor of the government, they would be auctioned off to generate more revenue for the agency.